Art historians have taken an interest in Hakuin Ekaku (1686-1769) in recent years. The old Zen master's ink brush paintings and calligraphy are prized today for their freshness and vibrancy. But even without the paintings, Hakuin's impact on Japanese Zen is incalculable. He reformed the Rinzai Zen school. His writings are among the most inspiring of Japanese literature. He created the famous koan, "What is the sound of one hand?" When he was 8 years old, Hakuin heard a fire-and-brimstone sermon on the torments of the Hell Realm. The terrified boy became obsessed with hell and how he might avoid it. At the age of 13, he decided to become a Buddhist priest. He received monk's ordination from a Rinzai priest at the age of 15. As a young man, Hakuin traveled from one temple to another, studying for a time with several teachers. In 1707, at the age of 23, he returned to Shoinji, the temple near Mount Fuji where he had first been ordained. The following year, he traveled north to another temple, Eiganji, in Echigo Province. For two week he sat zazen through the nights. Then one morning, at the break of dawn, he heard a temple bell in the distance. The faint sound rang through him like a thunderclap, and Hakuin experienced realization. According to Hakuin's own account, the realization filled him with pride. No one in three hundred years had experienced such a realization, he was certain. He sought out a highly regarded Rinzai teacher, Shoju Rojin, to tell him the great news. But Shoju saw Hakuin's pride and would not confirm the realization. Instead, he subjected Hakuin to the harshest possible training, all the while calling him a "cave-dwelling devil." Eventually, Hakuin's understanding matured into a deeper realization. 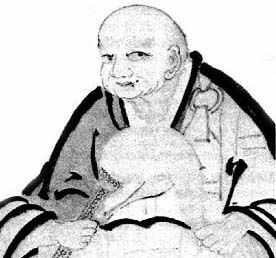 Hakuin became abbot of Shoinji at the age of 33. The old temple had been abandoned. It was in a state of disrepair; furnishings had been stolen or pawned. Hakuin at first lived there by himself. Eventually, monks and laypeople began to seek him out for teaching. He also taught calligraphy to local youth. It was at Shoinji that Hakuin, then 42 years old, realized his final enlightenment. According to his account, he was reading the Lotus Sutra when he heard a cricket in the garden. Suddenly the last of his doubts resolved, and he wailed and wept. As did the great Ch'an and Zen teachers before him, Hakuin stressed zazen as the most important practice. He taught that three things are essential to zazen: great faith, great doubt, and great resolve. He systematized koan study, arranging the traditional koans into a particular order by degree of difficulty. Hakuin initiated koan study with a new student with a koan he created -- "what is the sound [or voice] of one hand?" Often incorrectly translated as "the sound of one hand clapping," Hakuin's "one hand," or sekishu, is probably the most famous Zen koan, the one people have heard of even if they have no idea what "Zen" or "koans" are. The master wrote about "one hand" and Kannon Bosatsu, or Avalokiteshvara Bodhisattva as depicted in Japan -- "'Kannon' means to observe a sound. It is the sound of one hand. If you understand this point you will be awakened. When your eyes can see, the whole world is Kannon." He also said, "When you hear for yourself the voice of One Hand, whatever you are doing, whether enjoying a bowl of rice or sipping a cup of tea, all of it you do in the ​samadhi of living with one bestowed with the buddha-mind." For Hakuin, art was a means to teach the dharma. According to Hakuin scholar Katsuhiro Yoshizawa of Hanazono University in Kyoto, Japan, Hakuin probably created tens of thousands of works of art and calligraphy in his life. "Hakuin's central concern as an artist was always on expressing Mind itself and Dharma itself," Professor Yshizawa said. * But mind and dharma are beyond the realm of shape and appearance. How do you express them directly? He drew ordinary people -- soldiers, courtesans, farmers, beggars, monks. He made common objects like dippers and handmills into subjects of paintings. The inscriptions with his paintings sometimes were taken from popular songs and verses and even advertising slogans, not just Zen literature. This also was a departure from Japanese Zen art of the time. Professor Yoshizawa pointed out that Hakuin painted Mobius strips -- a twisted loop with one side -- a century before they were supposedly discovered by August Mobius. He also painted paintings within paintings, in which subjects in his paintings are relating to another painting or scroll. "Hakuin was, in effect, working with modes of expression similar to those devised two centuries later by Rene Magritte (1898-1967) and Maurits Escher (1898-1972)," Professor Yoshizawa said.